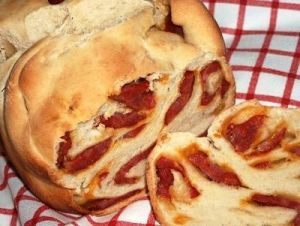 Bola ou Folar de Prosciutto | Prosciutto Bread is a Portuguese food recipe rolled up with ham. Dissolve the yeast in the warm water, letting it stand for 10 minutes to proof. Mix 3 cups of the flour with the salt in a large bowl. Make a well in the middle of the flour. Into the well, pour the lightly beaten eggs, tablespoons water, yeast sponge and olive oil. Use your hands to form a shaggy dough. Incorporate enough of the remaining flour until a medium dough (not sticky or loose) is formed. The dough should leave the sides of the bowl clean. Knead for 10 minutes until the dough is fairly smooth and gives a light spring when pressed with your index finger. Shape into a ball, give it a light dusting with flour and cover with a towel. Set in a warm draft-free spot to rise until double. Use a knife to divide the dough into 4 equal parts. Stretch or roll out each part on a lightly floured work surface, to about 6- by 8-inch rectangle. Spread slices of prosciutto over, leaving a 1-inch border all around. If using, add some grated cheese at this time. With the long edge facing you, roll it like a jellyroll. Pinch to seal the edges. Place on a lightly floured surface or place on individual sheets of parchment paper. Cover with a towel and let rest for about 30 to 45 minutes. Bake on a lightly oiled sheet pan at 425 degrees for about 25 minutes depending on size, until richly golden.